Her clients’ own a large and colorful art collection. “I wanted to create a space that would not compete with the art but would balance it,” said Tanoni. To draw the eye to the art rather than the appliances, she did away with an exposed hood and concealed the refrigerator, making it look less like a cooking area. “I was going for a beautiful background that balanced art. I didn’t want it to look industrial, more like furniture than kitchen cabinets.” Along the back wall, you’ll notice there are no visual outlets and the backsplash has no cutouts. “It made it look elegant and doesn’t scream ‘here’s the kitchen,’” she said. 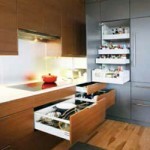 This Zonavita line utilizes drawers and pull-outs in base cabinets in lieu of shelving, as that traditional model makes it difficult to find and view contents. The system here prevents the homeowners from bending and stretching to access items. On the exterior, minimalist door handles, hidden outlets, and the lack of backsplash cutouts offer a clean, modern look. But the space is not just eye candy. Function was a tremendous consideration for Tanoni, who brought her perspective to the project as a former professional chef. 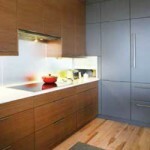 “There was a lot of underutilized space, not only in the cabinetry but in the circulation. I wanted to make it a very efficient and functional space but also beautiful,” she said. After consulting with Eileen Saunders, a certified kitchen designer at Kitchens at the Denver, Tanoni was drawn to the Zonavita line of cabinetry because of its customizable options and functionality. “I immediately knew it was what we were looking for. Having worked in a commercial kitchen, I have appreciation for the organization,” Tanoni said about the product, which offers user-friendly drawers versus shelving along with a zoning system.